Editor Daniel A. Olivas assembled a cadre of literary luminaries and up-and-coming authors to provide powerful and mesmerizing tales with complex characters that represent the diversity of Southern California. We meet young and old, gay and straight, rich and poor, the newly arrived and the well established. There's a screenwriter pitching an idea and a woman struggling with barrio life, youths trying to avoid gang life and others embracing it. We encounter aggressive jounalists, cement pourers, drunken folklórico dancers, curanderos, aging artists, wrestling saints, and many, many others, all set on the stage of Los Angeles. Contributors include Kathleen Alcalá, Frederick Luis Aldama, Lisa Alvarez, Victorio Barragán, Daniel Chacón, Kathleen de Azevedo, Alex Espinoza, Rudy Ch. Garcia, Estella González, Melanie González, Rigoberto González, Reyna Grande, Stephen D. Gutiérrez, Álvaro Huerta, Michael Jaime-Becerra, Manuel Luis Martinez, Alejandro Morales, Manuel Muñoz, Daniel A. Olivas, Melinda Palacio, Salvador Plascencia, Manuel Ramos, Sandra Ramos O'Briant, Wayne Rapp, John Rechy, Luis J. Rodríguez, Danny Romero, Conrad Romo, Jorge Saralegui, Jennifer Silva Redmond, Mario Suárez, Luis Alberto Urrea, Richard Vásquez, and Helena María Viramontes. 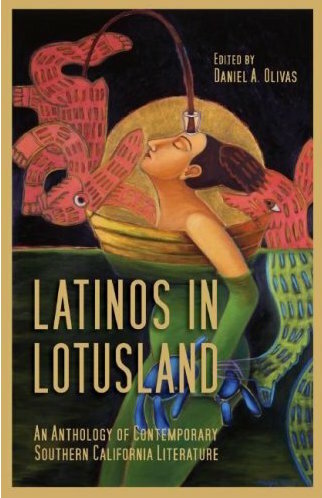 "Latinos in Lotusland is an engrossing anthology that shines a luminous light on Los Angeles. This collective vision of life, passion, and culture is a literary achievement. Highly recommended for any serious reader who loves the City of Angels." —Max Benavídez, award-winning author of Gronk. To order this book, phone toll free (866) 965-3867 or email brp@asu.edu. This title is available as an ebook from Amazon, Apple iTunes Store, Barnes & Noble, and Kobo.